Stephen Wacker and Marsha Griffin Discuss the Four-Part "Civil War" Season Finale! 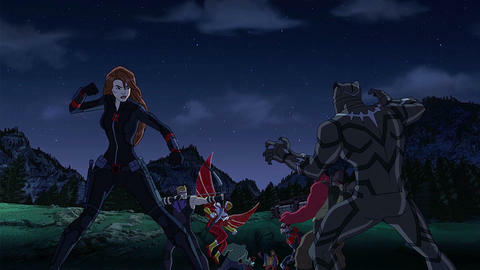 More Avengers than ever will assemble this weekend as the third season of their Marvel animated series comes to an end. With a title like “Civil War” you just know that the last four episodes of “Marvel’s Avengers: Ultron Revolution” will offer plenty of excitement for kid and grown-up fans alike! Even in a season filled with Ultron’s return, the Inhumans’ Terrigen Wave and the debut of characters like Ms. Marvel, Captain Marvel, Black Panther and Vision, the “Civil War” four-parter still promises to top all that as the classic team finds themselves faced with the biggest challenge of their careers: whether to support the government’s Inhuman Registration Act or not. Their decision will lead to battles with friends, a longtime enemy revealing himself and an ending that completely changes the status quo of a renowned hero. Vice President of Animation Stephen Wacker and Supervising Producer Marsha Griffin took a break from working on the next season of the series to discuss the action-packed season finale! Marvel.com: This season finale is impressive in that, as a four-parter it feels like a movie. What challenges does working in that format offer? Stephen Wacker: One thing we have to think about on the animation side is the notion that these episodes could run individually at some point in the future. I know Disney XD’s going to event-ize it and run it all together. But, we do have to keep one eye on the fact that the bulk of our audience is young, they’ve got a lot of things to watch and a lot of things to remember and there might be a significant gap of time in terms of when they’ll digest the next chapter of the story. Even with an event like this that has cliffhangers built into it, we’ve got to make each episode amount to something on its own. I think Marsha [and story editors] Eugene [Son] and Danny [Wolff] kept an eye on that the entire time. Marsha Griffin: Right, we have to keep on eye out that each episode can stand alone and be satisfying in terms of drama and characters and the plot line by itself. And then we have to make sure that all four of them build the way a movie builds and then come to a satisfying conclusion. It’s a little bit tricky, but that’s our goal. Stephen Wacker: There’s an old lesson I learned in comics: nobody owes you their attention. It’s the end of the season so we’ve got one eye on going out in a really big way and throwing in everything we can. We don’t assume at the end of the season that we’re going to get to do more, so we want to really go out as if we’re leaving it all out on the field. Marvel.com: When you all were planning this season, what were the themes, adventures and characters you wanted to hit on? Stephen Wacker: I knew going in that we had some touchstones we wanted to get to. I don’t think Marsha was quite here yet, but when we planned out the entire season in full, I sort of vomited up a bunch of things to Danny and Eugene that we had to do. We had to make Ultron important, I wanted the Inhumans to be important and I wanted a library of new characters and I knew I wanted Civil War to be a big part of our finale. They went away, took all of that and came up with the trajectory for the season and how all these pieces would fit together. I do think the season, thematically, hangs together more than we’ve done in seasons of just about any other show so far. There’s definitely a season-long plot. We did something similar in the last season of “Marvel’s Ultimate Spider-Man” and “Marvel’s Guardians of the Galaxy” generally has plot points that service the entire season, but this was intentional, “How can we get from point A to point B?” Point A being the team disparate at the beginning of the season and a team of even more characters and having been torn apart by the Inhumans [by point B]. Marsha Griffin: Clearly the arc of the season is Ultron, Ultron’s plans and then leading up to the Civil War arc at the very end which is friends versus friends, hero versus hero and the two different sides battling each other. There were individual arcs during the season that might have technically had nothing to do with it, but thematically connected to it. We had Black Widow fight Yelena Belova, so those are the two widows. We had Red Hulk fighting our Hulk. Along the way we tried to keep touching on the theme of friends versus friends and heroes versus heroes and good versions versus evil versions. We kept that in mind as we were plotting all the other arcs. I think it comes together in a really satisfying way, not just in terms of the Civil War arc, but in terms of the overall season as a whole. Stephen Wacker: And some of the things we’ve done this season will also be reflected in Secret Wars. We’ll pick up a lot of things. The show really feels like a classic Marvel comic to me where things are brought back. Marvel.com: You’d mentioned the themes of heroes facing off against heroes. What were some of the themes that bringing in Ultron and the Inhumans allowed you to explore? Marsha Griffin: There’s definitely political ramifications and an inadvertent parallel on some level to the political and social situation within the country and the world in terms of fitting in and the fear of strangers and the division between people. Ultron is the one who sets in motion the plan for the Terrigen Wave that unleashes the whole new wave of Inhumans. All these new Inhumans plus the old Inhumans have to discover a way to fit into society. Do they isolate themselves or do they try to integrate with regular society? That explored acceptance and being different. Do you shut yourself away from the world if you’re different or do you want to be a part of the community? I thought that was an interesting theme that we explored. Also too, it lead to the ultimate break for the Avengers. Where do you draw the line between what’s good and what’s evil? Where do you draw the line between morality and immorality? The Avengers eventually have to walk away when they feel that the government is doing something that they can’t stand by anymore. Those are the larger themes. Stephen Wacker: I think too, if I’m guessing, a lot of our audience can understand the feeling of, “There’s something different about me. There’s something maybe special about me, but even I don’t know what it is and I don’t know how to get that out of me.” I think the Inhumans story really puts that at the forefront. When we see characters like Kamala Khan realizing something about herself, that there’s more to her than she thought, I feel like that’s a universal theme that kids can wrap their heads around. I think adults can too. I’m personally very interested in exploring that and I think the Inhumans are a good vessel for that because they look just like you and me and as the Terrigen Mist spreads around the world people realize they have a connection to this thing that’s larger than themselves that they didn’t know about. Marvel.com: You brought up Ms. Marvel, but this season also saw the introduction of Black Panther, Captain Marvel, Vision and Songbird among others. You mentioned the expansion of the roster as an important idea going in. Why is that? Stephen Wacker: Creatively, it just helps to have new blood on the screen. We’ve had 52 episodes of our core Avengers and it’s just a nice addition. It’s a great way to introduce characters who are going to be important to the Marvel Universe because of film, because of television. This is a great tool to help get new viewers understanding who these characters are. I also think the Avengers in our world are so world famous and have saved the world so many times that it’s inevitable that other characters who have powers are going to want to either try to match up to them or join them. It just makes a certain amount of continuity sense. That was something we definitely did on purpose. I had the list of the characters I wanted to see this season starting with Black Panther, Ms. Marvel, Captain Marvel, Ant-Man and the Wasp, Vision. It’s pretty clear to see where most of those characters came from, the film slate. And the Inhumans is such a cool part of our live action slate coming up. Our stories in those worlds, in film and television, sometimes for really younger viewers, they’re just not the place to introduce our characters because they’re telling a more mature kind of story. These cartoons are a great introduction to these characters in one cool super hero story. You get them, you understand them. And so, in two years, they’ll know who Captain Marvel is when that movie comes out and I’d imagine they’ll be the first in line. Marvel.com: Of all the new characters, Ms. Marvel really jumps to the forefront with her fun personality. Stephen Wacker: A lot of that is Kat Khavari, our voice actress. She is really, really good. For interviews we should say that she’s not very good so no one takes her. [laughs] She has done a terrific job absorbing Kamala Khan and becoming her. She has such a great time in the booth with the rest of the cast. A lot of the magic for that character starts with her. Certainly our supervising director Jeff Allen also gives Kamala a lot of time and attention. And because she’s a shapeshifter, she’s really fun to animate. Jeff and his directors have a ball with her. Marvel.com: She has a lot of great lines in the finale, but one of the best came when they’re doing that classic Marvel cover image homage of the heroes lining up across from each other and she’s not too happy to be going up against the Hulk! Stephen Wacker: Yes! That moment where they’re all lined up, it is such a Marvel 101 sort of moment. This is what super teams do, they face off one-on-one. Just you describing it again gave me a chill. It’s such a fun moment and, in my head too, it helps pay off Dan Buckley’s decision to put a comic book guy over here to help with animation because it comes straight from Marvel comics. Marvel.com: There are a lot of great comic fan moments like Ms. Marvel meeting Captain Marvel or any of the Karnak fights where you get to see how his powers work. Stephen Wacker: A lot of that comes from our story editors Eugene Son and Danny Wolff. Eugene in particular is a huge comic book fan and Danny gets into the heads of our characters in some of the most funny, insightful ways. A lot of those moments come from them playing “What if?” with the toys in their heads. And again, Jeff Allen, his entire animation office here is covered with classic Marvel covers. He lives and breathes our characters and I think bringing them to life on the screen is a real thrill for him. Karnak is such a cool character to begin with, he’s got such a select power. It’s fun to think about how you’d fight a guy like that and Black Widow’s the right character for that. Marvel.com: On the topic of comic influences, it’s impressive how you take the framework of the CIVIL WAR story with registration while still changing major elements. How do you tackle something like that? Stephen Wacker: When we had the idea to do Civil War, the thing we were most challenged with just on a macro point was, we had basically told the Civil War story in the previous season in our Avengers Disassembled arc. We had Cap’s Secret Avengers crew versus Tony’s S.H.I.E.L.D. Avengers crew. We knew we couldn’t tell that story again and did have to come up with a different take on Civil War. Marsha Griffin: Yeah, it was the effort of just trying to find a way to honor the original Civil War story while trying to bring in the characters and give it a slightly fresh take, which is always a challenge for us in terms of making it our own. There is always the hope and desire that it tells a slightly familiar story in a fresh, new way so people don’t feel you’re just retreading the same old stuff. We want to feel like we’re adding something to the mythology. But you have to service all of those plot elements that have already been set out, so we can’t deviate too far from the path. That’s always a challenge. Marvel.com: With Civil War you’re not even just dealing with a twice-over comic event, but also a film interpretation. Stephen Wacker: Also, because of the recognition you mentioned, that buys us a certain amount of interest and attention. Then we can also slide in an introduction to the Inhumans, which historically — as much as I love the Inhumans and a lot of comic fans do too — is not something people in the outer world know much about. It can get awful confusing, awful quickly. But, for our audience we’re able to introduce the concept of the Inhumans through the vessel of Civil War and I think they’ll get it and understand this other group out there. Marsha Griffin: And that is a big challenge for us a lot of times. These elements — like the Terrigen Mist, how Inhuman society works, how they react to the rest of the world — do get confusing. Sometimes the mythology of it over years and years and years gets very heavy and intricate. It’s our job to try and boil it down to the essential elements that will allow kids to understand and allow someone like me who hasn’t been reading comic books for the better part of their life to grasp it. I’m the replacement for the six year old around here, so if it makes sense to me it should make sense to a six year old. Marvel.com: The stakes of this finale get pretty high with Ultron intending to destroy all life on Earth. Was there any worry that that might be too intense for kids? Stephen Wacker: I think we deal with big, dangerous themes enough. Even with the notion that the world could end, we need to find a way, through our characters, to make it fun and heroic. Marsha Griffin: Right, as long as you make sure the world doesn’t end, then you’re usually pretty good. Stephen Wacker: If we ended with Ultron’s victory, we would have gotten a note for sure. Marsha Griffin: It’s balancing the big danger with the big hope. We keep the level of danger equal to the level of hope. If one character still has [hope], it tempers [the danger] a bit. Stephen Wacker: We keep it light. Ms. Marvel’s a great example. That’s a heavy moment where our heroes have to face off with each other. It seems like the world is at stake, but we see the moment through her eyes and there’s levity there. It feels more human. In the movie, they used Spider-Man to do that. We’re aiming towards a more hopeful place, but there’s going to be some danger getting there. Marsha Griffin: I think kids, even when introduced to that, they believe in these characters so deeply that they know in their heart of hearts that these guys are going to save the day. Stephen Wacker: We talk to kids, we research group kids. I can guarantee you that any random kid is harder on our material than the most hateful comic book fan stereotype. Marsha Griffin: They’re no match. Stephen Wacker: They’re no match for a six-year-old who turns on our show and they want to see the world in danger. They want to see their heroes come through. That’s a great story for them. Marvel.com: The finale ends with that same mix of danger and hope, but we know Secret Wars is on the horizon. What, if anything, can you tell us about that? Stephen Wacker: I can tell you that it’s even bigger than this season. Civil War is a first step. I can tell you that it’s even more dangerous for our team and our new characters get even more spotlight as the season goes on. As we get into the main Secret Wars story, you’re going to see a lot more of the Marvel Universe than you ever have before in any of our shows. This season of “Marvel’s Avengers: Ultron Revolution” ends with the biggest of bangs as Civil War erupts January 28 at 11:00 AM PST/EST on Disney XD!